Not only does Fox News claim it's "fair & balanced;" but it also claims that the rest of the mainstream media is full of liberal bias. 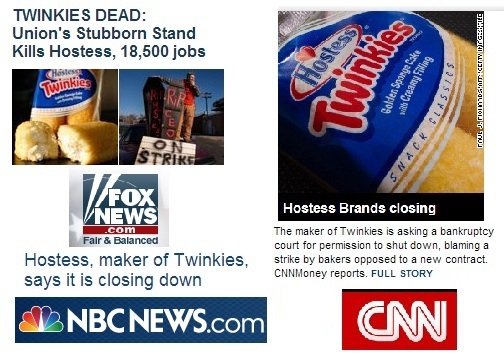 Attached are screen shots, from Fox, CNN, and MSNBC of the headline reporting the closing of Hostess Brands. You tell me which one has an agenda. As the saying goes, it's not what you say, but how you say it. Words matter. Real journalism, fair & balanced or editorial comment based on a political point of view? CEO Gregory Rayburn is closing the doors because the bakers’ union is fighting wage & benefits cuts. Message here – we don’t want the top level to suffer so the workers must suffer, or else. Very Romneyesk. You mean, even worse than their whole “Unions did this- Ignore the company’s practices since 2004!” load, AAP? Because I know that crosses the line a few times. Its not journalism in any color,no matter how Bile and the other empty headed Foxies want to spin it. Fux Noise is to real journalism what Twinkies is to real food.